His Holiness the Drikung Kyabgon Chetsang is one of two heads of the Drikung Kagyu order of Tibetan Buddhism. Born in 1946 in Lhasa, Tibet, then recognized at the age of four as the reincarnation of the previous Drikung Kyabgon and formally enthroned and educated at Drikung Thil, the main monastery of the Drikung Kagyu order in central Tibet. In 1959, China closed the monastery, and H.H. Chetsang was adopted by his former tutor, His Eminence Gyabra Rinpoche. After spending many years in a Chinese re-education and labor camp, Chetsang went to the U.S. to continue his education and earn a living. In 1978, he returned to India, taking up rigorous Buddhist practice, retreats, and instruction from many of the greatest living masters of Tibetan Buddhism. 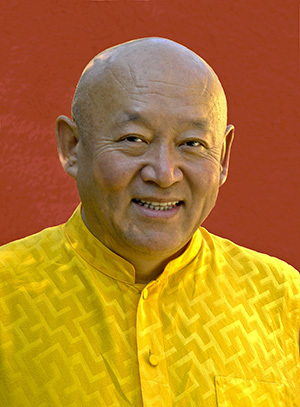 In 1985, he founded the Drikung Kagyu Institute, Jang Chub Ling, which provides traditional monastic and modern education to 450 monks and nuns; a meditation retreat center; and a project to collect and preserve all the Drikung Kagyu texts, as well as document the ways of life, philosophy, and religious traditions of the peoples of the Himalayas. His Holiness the Drikung Kyabgon Chetsang is one of two heads of the Drikung Kagyu order of Tibetan Buddhism. Born in 1946 in Lhasa, Tibet, he was recognized at the age of four as the reincarnation of the previous Drikung Kyabgon and formally enthroned and educated at Drikung Thil, the main monastery of the Drikung Kagyu order in central Tibet. During the Tibetan exodus in the late 1950s, his parents fled to India while he remained at Drikung Thil. In 1959, Communist China closed the monastery, and His Holiness the Drikung Kyabgon Chetsang was adopted by his former tutor, His Eminence Gyabra Rinpoche. After completing his elementary and middle school education in Lhasa, in 1969 he was assigned to a countryside farm, working fifteen hours a day doing hard physical labor. In 1975, His Holiness the Drikung Kyabgon Chetsang crossed the Himalayan border separating Tibet from Nepal—on foot and all alone except for fortuitous help from two strangers at one impassable point. He traveled to Dharamsala, India, the seat of the Tibetan government-in-exile, where he was received by His Holiness the 14th Dalai Lama and formally enthroned once again. In 1978, he returned to India, taking up rigorous Buddhist practice, retreats, and instruction from many of the greatest living masters of Tibetan Buddhism. In 1985, in Dehra Dun, India, he founded the Drikung Kagyu Institute, Jang Chub Ling, which provides traditional monastic and modern education to c. 450 monks and nuns; a meditation retreat center; and a project to collect and preserve all the Drikung Kagyu texts, as well as document the ways of life, philosophy, and religious traditions of the peoples of the Himalayas. For a full biography and more information about His Holiness Chetsang Rinpoche, visit the Drikung Kagyu website.